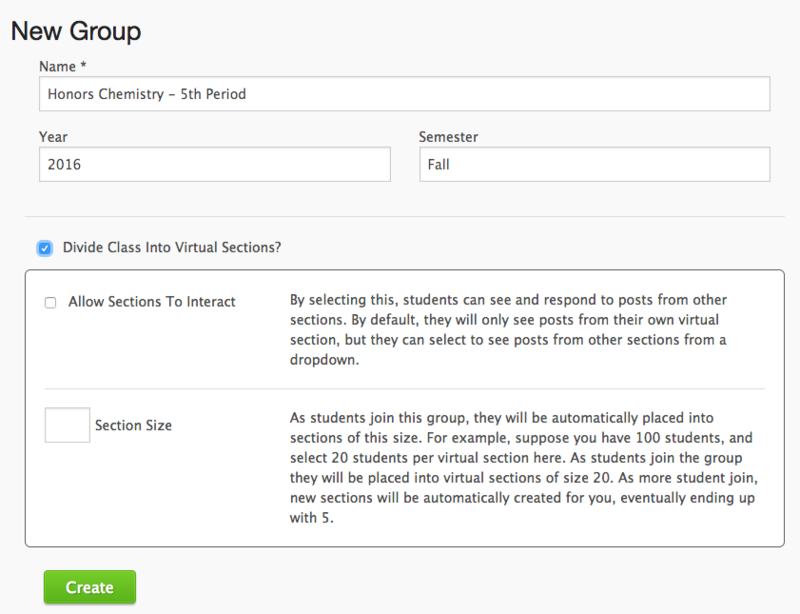 As seen previously, you can opt to divide your group into Virtual Sections. This will make it easier to manage larger classes, since you can divide students into smaller sections assign different instructors or teaching assistants to oversee those sections. If you would like to see the process of creating Virtual Sections in a video or want to know how to create a Virtual Section through an LMS, go here instead. You need to set a section size. Once you set this, students will automatically be assigned to sections of the chosen size. For example, if you have 100 students and set the section size to 20, as students join the group, they will be placed into virtual sections of size 20. You can also choose to allow students to interact with one another. After clicking , you will be redirected to the groups main page, titled Manage Groups. You should see a list of your groups. You can add more sections by clicking under Sections. Click the blue link of your group to assign instructors and add students.